American naval rifles use two numbers to indicate their size. These are shown in the form of 5″/ 25-caliber (or just 5″/25). The first number is the diameter of the bore, in this case, five inches. The second is the length of the barrel in calibers, with one caliber, in this case, being the bore diameter of 5″. So what 5″/25 indicates is a rifled cannon firing a 5″ diameter shell, and with a 125″ (10′ 5″) barrel length. Generally, a longer barrel is considered better for two reasons. First, the longer barrel allows complete combustion of the propellant charge before the shell leaves the barrel. This adds imparts greater velocity to the shell, giving it a longer range and greater striking power. Second, a longer barrel adds greater stability to the shell, making it more accurate. The negative side of a longer barrel is that it requires a more stable platform to achieve any gain in accuracy, and may actually be less accurate from an unstable deck. This was the reason the Navy adopted the 5″/25 for submarines, rather than an open-mount version of the more usual 5″/45 or 5″/50 normally found on destroyers and other surface ships. From very early in the war the inadequacies of the design were obvious. It was accurate enough, but relatively short ranged, and the three-inch shell lacked the destructive power of a heavier round. Designed as a quick-firing anti-aircraft gun, it proved to be less than ideal even for that purpose, and submarines were not issued the air-burst shells and fuse setters needed for shooting at planes. Because American submarines were able to continue using their deck guns through most of the war, the commanding officers started lobbying for heavier, more versatile weapons very early. A large number of fleet submarines were re-equipped with this deck gun. 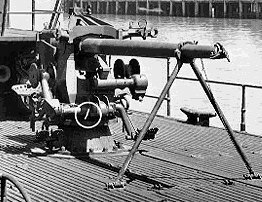 A former surface ship gun (these were the standard main armament on World War I destroyers), it was better with regard to shell size and range, but the pedestal mount allowed only limited elevation, and the long barrel, intended to improve accuracy, was far less effective on a submarine’s lively deck. The 4″/50 was the standard deck gun on the old S-Class submarines. One of the more common complaints even in that application was that the gun was highly reliable—but only if you never submerged. During the inter-war period, a fashion developed for very large, long-range “cruiser” submarines, intended to be utilized as commerce raiders in the event of war. The ultimate development of this principle was the French Surcouf, which mounted a pair of 8″ guns in a waterproof turret at the front of the conning tower, and carried a scouting plane in a waterproof hanger aft. It held the distinction of being the largest, and most heavily armed, submarine built prior to the nuclear age, but proved of little value in combat. The United States built three of these big submarines, Argonaut, Nautilus, and Narwhal. Argonaut(SM-1) was primarily designed as a mine layer and carried 60 mines in addition to her bow torpedo tubes. The other two were built as “cruiser” submarines. All three mounted a pair of 6″/53 deck guns, one forward and the other aft. Once again, these guns were originally developed for surface vessels where, mounted in single, double, or triple turrets, they had been used as secondary armament in battleships or main armament in light cruisers. All three submarines mounting them were eventually converted for use in special operations, as their large size allowed room for transporting troops. They were generally not used on offensive operations after the first few months of the war, again because of their size, which made them very slow diving compared to the fleet boats, and poor submerged maneuverability. This was the first American submarine deck gun designed specifically for submarines and proved the most effective because of this. The short barrel improved accuracy on a submarine’s rolling deck, and the five-inch round was powerful enough to cause serious damage to a target. Late in the war, several boats were fitted with a pair of 5″/25s, as well as a simple director system, allowing coordinated fire. The pictured gun is mounted aboard U.S.S. Cod, now docked in Cleveland and open to the public. For additional pictures and more information on this gun, take a look at this article. Built under license from the Swedish manufacturer, the 40-mm Bofors was one of the most popular medium anti-aircraft weapons of World War II, and in a modernized form remains in production to this day. 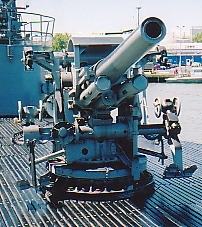 Most naval applications used a twin mount. Not originally fitted to submarines, the 40-mm was added to the arsenal when commanders argued that they needed something to fill the gap between the 20-mm and the deck gun for close-in attacks on small vessels. The single-barrel “wet” version used on submarines had seats for the aimer and trainer, who could elevate, depress, traverse, and aim the gun with hand controls. Stops were fitted to prevent traversing and/or depressing the gun to where it could hit the boat. Sights were fitted to both sides of the gun so that either operator could aim when necessary. Later in the war, a 40-mm was usually installed on the cigarette deck at the aft end of the conning tower, where it replaced the original 20-mm mount (which, in the case of most early boats, was itself something of an afterthought). Some boats also added a second 40-mm in the forward gun position at the front of the conning tower. Ready use ammunition was kept in pressure-proof lockers near the gun positions, where it was easy to get at. For a country that has been adamantly neutral for many years, Switzerland has still made its contributions to the art of war. The 20-mm Oerlikon automatic cannon is one of these. The smallest weapon in the American arsenal firing an explosive shell, the 20-mm was a close-in anti-aircraft machine-cannon. The shells were loaded in a drum magazine, and a single gunner aimed and fired the gun. Pressure-proof storage was provided for these guns, but it was found that they could tolerate immersion reasonable well provided the barrels were changed frequently. Most wartime production fleet submarines originally came fitted with at least one 20-mm, on the after part of the conning tower and, after the pre-war bridges were cut down, reducing the silhouette and, in the process, creating a second gun position at the front of the bridge, a second gun was fitted. When the skippers could convince the right people, these were both often replaced with 40-mm mounts, giving an increase in both range and destructive power. Fleet submarines all had mounting points for machine guns fitted at various locations around the bridge. The actual guns varied, though the general rule—at least as far as the submariners were concerned—was “the heavier the better.” The guns and ammunition were stored in pressure-proof containers near the mounts, where they could be quickly extracted on surfacing. The preferred weapon was the .50 caliber Browning heavy machine gun. (In small arms, one caliber is one inch, with the diameter of the bullet measured in hundredths of an inch, so a .50 caliber projectile is half an inch in diameter.) This heavy machine gun was actually developed as a light anti-tank weapon, back in the early days, when tank armor was still rather thin. It proved an effective machinery killer, and can still be found in the inventory. The .30 caliber Browning medium machine gun was also commonly found. This fired the same .30-06 round as the standard service rifle and was designed as an anti-personnel weapon. You could also find some older weapons, such as the British Lewis gun, fitted to some of the old S-class submarines. These were originally chambered for the British .303 rimmed cartridge, but American versions were rechambered for the .30-06. The Browning was belt-fed, while the Lewis was loaded with a flat drum magazine that sat on top of the receiver. Both would kill an enemy, but the Browning was generally considered the superior weapon. In addition to the heavy weapons, submarines also had an arms locker where “personal” weapons were stored. Officers had the standard issue Model 1911-A1 Colt .45 caliber semi-automatic pistol. Another of John M. Browning’s designs—he was the most prolific American arms designer of the late 19th and early 20th Centuries—the M1911 in its stock form was never the most accurate handgun but made up for this with one of the most effective single-shot manstopper cartridges ever produced. And, as handguns are intended to be used at very short ranges, accuracy was less an issue than some might think. Submarines also generally carried a few Thompson submachine guns, which fired the same .45 ACP round as the M1911 pistol. These were normally fitted with the straight 20-round box magazine, rather than the 50-round drum magazine usually seen in gangster movies. M-1 Garands and/or 1903 Springfield bolt-action rifles could also be found, mainly intended for shooting at floating mines. These “personal” weapons were normally kept under lock and key. Certain movies to the contrary, small arms were never kept within easy reach of the crew for the simple reason that they didn’t ordinarily need them and, on those occasions when they did, there would almost always be time to issue them.